I just finished watching the appeal made by Master Cobra Mansa about the campaign to raise funds to finalize the film “Angolan Roots of Capoeira”. 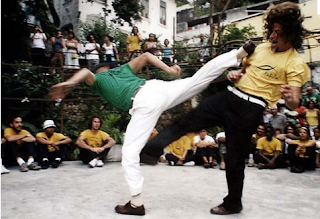 As the majority of us already know, Cobrinha as much as Matthias have dedicated themselves, each in his own way and manner, to the research of the art form we now call Capoeira (Angola, Regional, Contemporary... this is not relevant here). , and I believe, many other people as well, are particularly interested to see a result that matches time and energy these two capoeiristas/researchers have invested to conclude their dream (paraphrasing Cobrinha). They are committed to finalize the film in the best possible way. In other words, the project needs another small investment to mainly conclude the edit. Capoeira as well as we, the capoeiristas, deserve a product of high quality, not only in relation to the edition, translation and other technical aspects of the project, but particularly for a whole generation of citizens, artists, researchers, capoeiristas, musicians or educators who are, increasingly, interested in the interaction between the peoples, the diversity and continuity of the traditional cultures of the world. In sum, I believe that a little contribution, as small as it may be, will help to make real this very special dream, which I think is a dream we all share.